According to regional civil society groups, the Pacific Islands Forum leaders’ summit – held in Pohnpei, an island in the Federated States of Micronesia, from 7 to 11 September 2016 – has delivered too little in terms of tangible outcomes on the issue of West Papua. The meeting carried with it a lot of expectations, as NGOs were pleased with the increased engagement shown by the Pacific Islands Forum. The civil society groups – joined by Solomon Islands PM Manasseh Sogavare - had identified West Papua as a key issue to be addressed. However, in the face of ‘Indonesian sensitivity’, all that took place was a superficial discussion of the issue and no concrete actions were taken. Pacific Islands Forum leaders have been accused of hollow talk about listening to the people of the region on important issues like West Papua. Following last week's Forum leaders summit in Pohnpei, regional civil society groups have voiced disappointment at what they see as a lack of any outcome or substance on the issue of West Papua. Papua had been one of the big regional issues identified by the Forum secretary-general Dame Meg Taylor as being on the leaders' agenda, ahead of the summit. However in the end, leaders merely concluded that the issue of alleged human rights violations in West Papua should remain on their agenda. Furthermore, after the resolution of last year's Forum summit to urge Jakarta to allow a fact-finding mission to West Papua, the matter appears to have dropped off the table. Dame Meg confirmed in Pohnpei that Indonesian sensitivity over the term "fact-finding" in relation to Papua meant that it would not accept such a mission. But she said concerns about human rights abuses and the self-determination struggle in West Papua ran deeply in the Pacific and demanded focus from the leaders. Before the summit, Pacific civil society groups voiced satisfaction with what they called the improved engagement they were being accorded by the Pacific Island Forum. They identified West Papua as among the key issues needing the Forum's attention and development of meaningful policy discussions. Taking stock of the Pohnpei summit, Joe Collins of the Australia West Papua Association said that while it was encouraging that Papua was mentioned in the communiqué, there was no specific action taken. 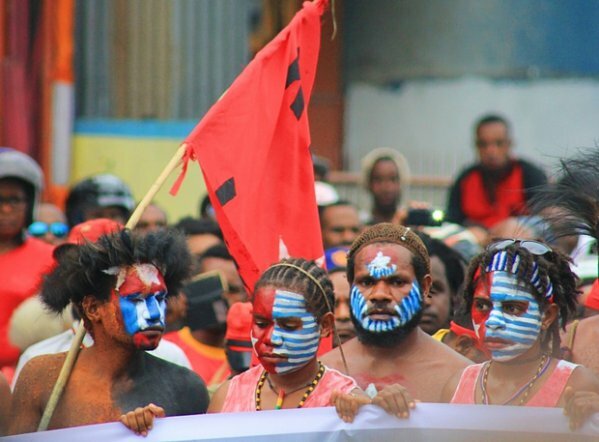 "There's no doubt there's a huge groundswell of support from the people, civil society organisations and church groups in support of West Papua," he said. "And for all the talk about (the Forum) being inclusive and listening to the people, the fact that it's not really on the agenda that much would indicate that the leaders are not really listening to the people."